Welcome to THE COUCH Book Club. Brad Thor has published six novels starring his hero Scott Harvath. His latest, "THE FIRST COMMANDMENT" is due July 17th. 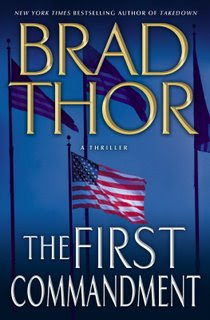 We have to tell you, this is the first BRAD THOR we have read. We are planning on going back to read the first five of the series as soon as we can make that happen. Thor's lead character, Scott Harvath is an ex-Navy Seal, who works for the US Government in the battle against the world's terrorists. Thor does a good job of throwing in a reference or four throughout this book to past incidents (obviously taking place in the earlier adventures) in Harvath's career, which shape the dynamics of the power play being waged in "THE FIRST COMMANDMENT." Mr. Thor does not go overboard with weapons and gadgets, as he paints a believable picture of our world today and the things that could be happening. Sure, we said "could be"...because do we really know for sure that there are not incidents everyday that we never hear about? "THE FIRST COMMANDMENT" sends Scott Harvath around the globe in the hopes of finding out who has targeted those close to him, while being shut out of the investigation by his employer. He is confronted with his past, while worrying about his future and the future of those around him. As a regular reader of Tom Clancy, Vince Flynn and Nelson DeMille, who feels their respective heroes; Jack Ryan, Mitch Rapp and John Corey (though he is a cop and not a spy-hunter), have been made human by their writers, not a super-heroes, but men who bleed and have real lives and cares. If you have read and enjoyed Mr. Thor previously, we think you will enjoy his latest thriller. Last year the Richard Brodhead, President of Duke University reacted to the public outcry, anger from many on the faculty and pressure from various organizations and fired their head Lacrosse Coach Mike Pressler. They also suspended the entire lacrosse season. Funny thing happened in the end, the accuser totally recanted, the DA ended up looking like a fool in front of the entire country and now, Duke has asked the NCAA to say "oopsie - do over" and has allowed Duke the opportunity to give the players another year of eligibility. Unfortunately. last year's seniors lost out on their last year of playing college sports...Mike Pressler lost one of the top jobs in his profession and went through a period of time when no one would talk to him. Luckily in Smithfield, RI, the men and women who are in charge of Bryant College looked at Mike and saw a Coach who stood up for his players and could actually coach and lead young men. For 16 seasons at Duke, Pressler compiled a 153-82 record at Duke, winning the Atlantic Coast Conference championship three times, while leading his team to 10 NCAA tournament appearances as well as the Division I men's national championship game in 2005. Pressler was voted ACC Coach of the Year three times and also was honored as the U.S.I.L.A. National Coach of the Year in 2005. This year at Bryant College? Pressler led the Bulldogs to an 11-4 record. Has Duke reached out to Coach Pressler in public to apologize? Not that we have heard of...they were too busy celebrating second place in the NCAA D-1 championship. Now, did the players step over the line with the party and the strippers? That is a hard question to answer. Obviously there was alcohol and not everyone at the party was of "legal drinking age." But it happened in college all over, not just with the jocks. Soon after the allegations were made, 88 Duke professors (commonly referred to as the "Group of 88" or "Gang of 88") from the Trinity College of Arts & Sciences placed an ad in The Chronicle referring to the circumstances surrounding the allegations as a "social disaster" and quoting individuals citing racism and sexism in the Duke community. In three departments, more than half of faculty signed the statement. Ahhh Vinny that song! Wooo!! The waves in the background..the seagulls! I love it! Me read a book? HAH! Too many blogs to read! The flip side of the Duke debacle coin is this: if the university had done nothing and adopted a "wait and see" position, they would have been in an untenable position. The alumnae would have demanded action of some sort, a scapegoat if you will, to make a public statement that such behavior, regardless of proof of guilt (or lack thereof) is inexcusable and intolerable. Given the media focus of the depraved behavior of professional athletes, universities are under pressure to make sure that even a hint of "undesirable" behavior is not only acknowledged but punished as well. Yeah - I'm still annoyed at those who rushed to accuse in the Duke case. I don't see full page ads taken out for apologies either. People need to think before they speak, and remember innocent until proven guilty. Thanks for the referral to this Brad Thor. I enjoy Clancy, DeMille, Griffin, Dale Brown, etc. I may have to check this guy out. The faculty owe everyone on the team and the coach one big apology. "Innocent until proven guilty".... does this actually still exist in this country??? It should, but with so much media... it doesn't. I'll put it on my "to get" list. SONGBIRD: Good points, but they threw college students and a coach under the bus before the real truth was known. I would not have a real problem if the penalty for having a party as they did was the reason for the University to cancel the season. That in itself did not warrant the suspension of the entire season. That was a knee-jerk reaction to jump the gun on Lacrosse only, before the NCAA stepped in and really hit them hard. That and because they had the "Gang of 88" taking out newspaper ads and Reverends Jackson and Sharpton screaming into cameras and feminist groups (this one amazed me. No one made that young woman do what she did. She saw a payday, plain and simple), all screaming for blood and the media soaking it up. I also blame the DA who turned this case into a debacle by not doing his job correctly and only seeing a higher public office flashing in front of him. Unfortunately that was not higher public office, it was the train of shame headed right for him. Thanks for the comments..there are always two sides to each situation. TRAVIS: An apology would be nice. DO read him. I look forward to going back and seeing the progression. MORGEN: Thanks, glad you enjoyed. Hmmm, that Brad Thor book looks interesting. I love spy thrillers and such. Me thinks I shall have to keep this series in mind. Thanks for the review! this was about sports again, right? sigh... what about a post about cruiseships with chocolate cake on them? ha ha ha. i am so pathetic! great more books i need to read, you know I do have a life. as for duke, im a dukie in spirit but they botched this up totally. But when it comes to big money of college sports, you always go for the money. My mother used to buy my secret admirer all of the Balducci novels. I don't know as he's ever read any of them, but I have! LOL, and now since her passing, my holiday gifts to him always include the latest Crighton, and the latest Balducci--Hey, a girl needs a source of fiction to draw from, am I wrong???!!! From now on, though, I think I'll include the latest Thor novel as well (though, if I can get him to stop training for triathlons, perhaps he'll have a few minutes to read/review this particular book as well!!!) The First Commandment IS good! Sheesh.. I call in.. I give the Doc an opportunity to plug the book and Mr Thor's appearance on the show.. and I get zip. I believe there as wind of "let's hurry up and disassociate ourselves" from potential clusterfucks in your country... Innocent until proven guilty? Novel idea... is there really such a thing? I'm beginning to wonder. You didn't ask, Anndi! Sorry, I'm all out now. I owe ya.